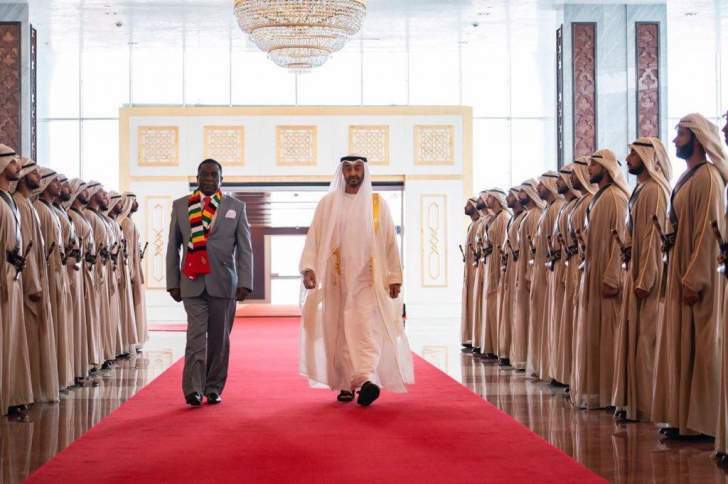 PRESIDENT Mnangagwa yesterday characterised as an eye opener his visit to the United Arab Emirates (UAE) saying its rapid development was confirmation of the extent unity can fast track a nation's modernisation. Zimbabwe is pursuing an economic transformation agenda under President Mnangagwa's Vision 2030, which seeks to transform the southern African country into a middle-income economy in the next 11 years. Its rapid economic growth becomes a lesson for countries like Zimbabwe aiming to achieve the same. In an interview with journalists after touring the Sheikh Zayed Grand Mosque and the Wahat Al Karama Memorial centre in Abu Dhabi yesterday, President Mnangagwa exhorted unity and joint pursuit of a national vision. "I am so happy that His Honour Sheikh Mohammed invited me. I had no appreciation before of the level of development that has taken place in the Middle East of this nature. It (visit) is an eye opener that if people are united and have vision they can create institutions and infrastructure of this nature," said President Mnangagwa. Commenting on the Wahat Al Karama Memorial - UAE's version of a national heroes acre - President Mnangagwa said the shrine preserved the history of that nation's patriotic sons and daughters. "Well this is a shrine which preserves the history of this nation, the UAE. It preserves the history of the patriotic sons and daughters of the nation both military and civilian who laid down their lives for the good of humanity and for generations to come. This shrine shall remain a historic lesson for those generations that will come. We must congratulate the leadership of this country for creating this shrine," he said. The Wahat Al Karama is a war memorial honouring the UAE's soldiers and other citizens who sacrificed their lives serving their nation. The President described as magnificent the Sheik Zayed Grand Mosque whose construction took about 11 years. It ranks among the world's largest mosques and has attracted millions of tourists. "Honestly, I have never seen a mosque of that size, of that beauty, so magnificent it was beyond my belief. I understand it took 11 years to build but we must congratulate the vision of the founder who envisioned that design, that mosque. It stands as a most magnificent mosque in the world in my view," said President Mnangagwa. He said African countries, Zimbabwe included, have a lot to learn from the UAE's economic transformation experiences. "I have been told that there was a sea in some place where there are structures. It boggles the mind how a sea can be converted into land and be able to have structures of that nature sitting where in the past it was a sea. It is a big lesson to us who are coming from Africa, coming from the countryside, mountains and bushes, we must congratulate the imagination and ingenuity of these people here," he said. President Mnangagwa returns home today after cutting short his visit to the UAE owing to challenges caused by Cyclone Idai, which has killed 70 people and destroyed infrastructure.